I’m still laughing at all your comments about the April Fool’s joke (found here). That toilet still makes me smirk when I think about it. I love the sale racks at the store. Especially for kids clothes. I found the two items below at The Baby Gap for $1.97 each. And then all sale items were 25% off, so I got them for $1.50 each. Stores always put out of season stuff on sale, to make room for the new stuff. But don’t let the out of season sales deter you from buying them for the upcoming season. I always try to keep my eye out for excellent deals, even if they are fall/winter clothes when we’re approaching spring/summer…..or vice versa. I always look to see if I can do a few adjustments to the item. Because a quick alteration will allow you to use the clothes when you need them. I bought these a year ago in a size 3-6 months so I could use them this year for the spring and early summer. I knew I could cut off the sleeves and use them for the warmer weather. I chopped off the sleeves and re-cuffed them and then used the sleeve scraps to make ruffles on the diaper cover. Mmmmm……ruffles always add charm. No longer a fall/winter-ish dress. It’s all ready for the spring and summer months. I’ll show you, Baby Gap!!! And with this one, I removed the sleeves……..and added some different scrap fabric I had, to make the ruffle bum. Nice and easy and perfect for warmer weather. How are the sale racks in your area? Any good deals going on right now? Use them to your advantage. Or how about those hand-me-downs that need some altering? Grab them and make them work for you. Want to see how I made the changes that I did? Again, these items started out as long sleeves. I cut the sleeves off about 1/4 inch longer than I wanted them, for a seam allowance. Then I cut the rest of the sleeve piece open to use for the sleeve cuffs and the ruffles on the bum. Depending on how much fabric you have from the sleeve, will determine how wide and full your ruffles will be. I wanted 3 ruffles on the bum and enough for a cuff on the sleeve. So I cut 4 strips from each sleeve (each were about 1 inch wide)…..so I had 8 strips total. And since I needed the strips to be longer (about twice the length of the area you want to place ruffle is a good guide), I attached 2 strips together to make a longer one…….and ended up with 3 long strips. Then I serged the edges and made a basting/gathering stitch down the center of each long strip. Then gather in the strips and pin them to the back of the diaper cover…..
……and then sew the strips down, right on top of the basting stitch. For the cuff, I folded one of the extra strips in half lengthwise and then ironed it flat. Then I measured the opening of the sleeve where the cuff would be placed and trimmed down this strip to the right length (including a seam allowance). Then I sewed the two ends together to make a circle. Then I slid the circle cuff over the outside of the bottom of the sleeve, with right sides together. Also, be sure to line up the raw edges of the cuff with the raw edge of the sleeve. Pin the cuff in place with the seam of the cuff matching up with the seam of the sleeve. See the gathered fabric of the sleeve under there?? Then stitch the cuff in place, using a zig-zag stitch, to allow for some stretch. I ended up zig-zagging twice, just fr security. Then, slide your iron in there and iron the edges towards the inside of the shirt. Steam a bit from the outside too. See? All nice and finished with a smaller sleeve opening. Do the same thing to the other sleeve. And the dress and bloomers are now done. And cute and spring-y as ever. This shirt had some elastic smocking on the sleeve already. So I just cut off the sleeve right below the smocking and didn’t worry about hemming since knit doesn’t fray much at all. For the bum, I ruffled up some woven cotton strips, the same way I did above, and attached it right to the bum of the onesie. Such a simple alteration to make a onesie an outfit. Turning the warmer clothes into cooler clothes can sure save you some money if you think about the potential of the clothes at the store…….or in your closet. Now go and see what you can find. For more funny videos, click HERE. « Did I trick you?? Gorgeous!! I love them both and you've totally inspired me to alter my kids shirts to t-shirts for spring/summer! Great way to get more use out of their shirts, that's for sure!! I am so jelous of your creativity!!! Love these! love it! I have to say very, very clever!! what an idea. I always thought I would ruin something. But being here in blogland as given me different thoughts on that. This is so stinkin' cute! Great idea. You amaze me with your ingenuity! You are such a blessing in my life with all of your amazing ideas. I can save money AND get my hankering for crafting out of my system. Thanks!!! I especially love the polka dot one. When I cut knits off I always made a ruffle edge…but this looks so much better! I'll have to try it. OMG SO CUTE! Great job!! I love my local Target for off season deals, but I usually just save them for the following season. 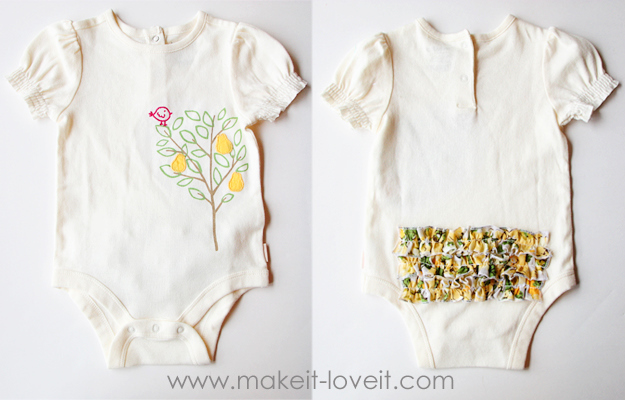 I didn't really think of altering for a different season–brilliant! And the ruffles are adorable. Do you think my 6-year-old could sport the cute ruffle bums??? Hmmm, maybe time for another baby girl! I love these! I really need to have a little girl!! I don't think my husband would be thrilled if our little guy was running around in ruffles this summer! **Pout** Thanks for all the great ideas! I haven't commented too much on your blog, but I cannot leave without saying how adorable those two little outfits are – wonderful job!! I'm about to alter a few items for my two girls wardrobe – isn't it so much fun to make a cute outfit EVEN cuter?? Wow, those came out awesome. They look like something you'd buy in a store for $20 each! What a fabulous idea! So going to Target tonight to check the sales rack to alter some things for my girls! Thanks!! WOW! I am SUPER impressed! I usually just try to guess the size my kids will be in the fall but I LOVE this!!! Your infant outfits are fabulous! Love, love, love them! I scheduled a feature on it to share with my readers today at Extreme Personal Measures. I may just have to attempt this one! Thanks for the tutorial on this! I keep wanting to do this, but am too chicken to risk ruining a shirt! Now I'm going to have to try it. Hmmmm….which shirt first….?! How awesome is that?? Thanks so much for a great tutorial- I've thought about cutting sleeves off those long-sleeve shirts for years, but didn't know how to do it. It actually looks much easier than I thought! And the ruffle bum onesies- classic!! i sometimes really wish you were my neighbor and best friend and i could bring projects over to your house for you to do for me!! :) Love the concept of altering…i so SO hate sewing clothes, so the likelihood of me doing it is zilch, but i do appreciate your amazingness! your polka dot dress is so much cuter than gap's! lol take that! I love to shop the clearance racks in the Spring for pants that I then cut off to make into capris or shorts. So much cheaper! What a great idea! I cant believe I have never thought about doing that until reading your post. The ruffles on the bum are too cute. Seriously, I think your changes make the clothes look even cuter!!! Well done! so so cute! it looks like you bought it that way! Goodness, Gracious you are amazing! What a great idea! I never would have thought to do that! Do the wheels in your head ever stop turning? Very cute. Excellent tips & inspiration. I love how you changed that up a bit to make it work. I'm always looking at things like that too and contemplating whether I could de-sleeve it and make it work. The only things is that sometimes the material is on the warm side with the winter stuff and it would still be too hot to wear. But when you see a combo like this, I suppose go for it! And i kneewww i should have bought some clearance items while i was at target today!!! Omg… DAMN IT DAMN IT DAMN IT!! lol. i just learned the art and enjoyment of repurposing the other day too. I was sooo drooling at target. DAMN IT DAMN IT. lol. sorry. vent. Great Idea! I would have never thought to take winter clothes and alter them. I would just buy clearance clothes and find someone to give it to. But I could TOTALLY alter the clothes. Thanks for the great ideas! Very cute! Just one comment about the cuff. I don't like seeing the seam. So, I sew the sides together first and then I fold it, iron it and sew it to the sleeve. This is a good opportunity to tell you how muxh I enjoy your blog!! You must have read my mind, just what I was looking for! I got some cute long sleeve shirts as baby shower presents but they won't fit my girl till the summer. yay!!!! Oh how sweet. Absolutely love this change up. Fabulous. Hugs and happy Tuesday! Those are so, so cute! I love any ruffled-bum stuff! I'm wondering how long I can put my 1 year old in ruffled-bum shorts. Another 10 years or so? Such a great idea! I have a lot of different baby girl clothes hand-me-downs and was worried we wouldn't get to use them all because of the seasons. At least now I know what to do with the long sleeved shirts if it's spring/summer. Now we need a tutorial on adding an under-sleeve or sleeve extension to a short sleeve shirt. Thank you so much for this wonderful post! I have just entered the scary world of sewing knits, and this tutorial makes it look so easy. You're teaching me (and so many others) so much, Ashley. Thank you! "I'll show you, Baby Gap" made me spit out my drink. You. Are. Hilarious. Genius!! :-0 I just bought my 4 year old a few long sleeve shirts in January that I love but now its getting too warm! I was bummed. Thank you for this awesome tutorial! I absolutely love your stuff! For a boys shirt, or altering a sleeve without gathering it, just fold under the raw edge of the shirt and hem it. Use a longer stitch length if your shirt is knit, so that it doesn't pull the fabric. I featured this project on my blog today! Thank you so much for this! My toddler has many long-sleeve shirts that would work for spring. They definitely won't fit her next time cold weather comes around, so this is a perfect idea!! I don't sew clothes, but I think I can handle this! Thank you thank you thank you! You are so clever and creative!!! I love your blog. I WISH I had a little girl to sew for. I would copy these in a heartbeat. I just found your website and LOVE your tutorials!!! So simple and inspiring! Although I don’t have a little girl to sew for…..yet…..I will apply some of your clever ideas to my pet fashions! Great gift ideas too. Thanks so much! Love your creativity and thriftiness! Great work and super cute! I just saw this on Pinterest and want to say what a great job you did with the tutorial! I have sewn for years and this is a great idea! I’ve done ruffles before but have problem with them sometimes. What type of stitch do you use to secure it to the garment? And do you pull out the basting stitch when you are finished? Merci pour l’article, je mets le site direct en favoris ! :) Je dois dire que je ne regrette en rien de m’être abonné à votre weblog. A bientôt. was as effective at treating acne as benzoyl peroxide, and it didn’t result in the peeling and redness that the peroxide sometimes causes. Natural rosehip oil can help to treat the dry patches; it can be applied all over your body, including your face. It contains vitamins A, E, and other essential nutrients including omega-3 and omega-6 fatty acids. Love it and have inconsistent success using the machine. Do you have any sewing tips for baby sleeves? I can’t fit the tiny sleeves around the arm and it’s tricky to sew those little things. I did one sleeve well and the other didn’t look as nice. Maybe there’s a post that covers this and I’m putting in the wrong search terms? Awesome Thinking and tutorial thanks for sharing. find out more baby girl t shirts variety at Snug-a-Licious.